A current food trend is the emergence of exotic superfood ingredients such as elderberry, aronia, haskap and moringa. Moringa is a plant native to South Asia and grown throughout the tropics. It's considered a superfood because the powdered leaves provide protein, calcium, iron, Vitamin A and Vitamin C. Peace Corps volunteer Lisa Curtis discovered it when she was living in West Africa and suffering from malnutrition. Now back in the US, she is the founder of Kuli Kuli Foods, a company that sells moringa based product in the US and helps to improve the lives of women like the ones she worked with, in Africa. When I met Lisa I was inspired by her story and also curious to try experimenting with moringa, which comes in a powdered form, looking a bit like matcha but tasting more herbal with a slight bitter but not unpleasant edge. Aside from adding it to smoothies or using it bars, I thought it might be good in a chia pudding. Lots of chia pudding recipes use coconut or almond milk in addition to yogurt. I'm not really sure why! I used both whole milk and full fat Greek yogurt for this little verrine but you can use any milk you like. It makes a healthy and yet indulgent snack or light breakfast. The bitterness of the moringa is offset by a tiny bit of honey and the fresh raspberries. Gently heat the milk and honey in a small bowl in the microwave or in a saucepan just until the honey disolves. Whisk together the milk and honey mixture, Greek yogurt, chia seeds and morinaga in a bowl then transfer to a container, cover and refrigerate for at least 4 hours but preferably overnight. 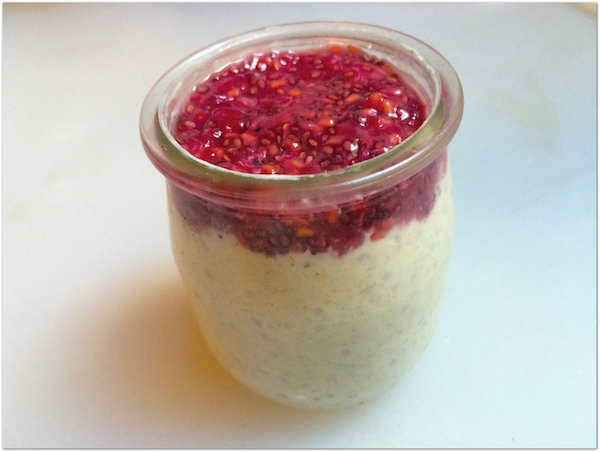 Mash together the raspberries, honey and chia seeds and place in small container, cover and refrigerate. Portion the pudding into 4 verrines, cups or ramekins and top each with a spoonful of raspberrry sauce. Disclaimer: I was provided with samples of moringa to use in this recipe. I was not compensated monetarily for this or any other post on this blog.